The planet, known as WASP-39b, has three times as much water as Saturn does, NASA said on Thursday. WASP-39b can give new insights into how and where planets form around a star. Washington: Astronomers have detected a large amount of water in the atmosphere of a hot, Saturn-mass exoplanet some 700 light-years away. Though no planet like this resides in our solar system, WASP-39b can provide new insights into how and where planets form around a star, the researchers said. Located in the constellation Virgo, WASP-39b whips around a quiet, Sun-like star, called WASP-39, once every four days. The exoplanet is currently positioned more than 20 times closer to its star than Earth is to the Sun. It is tidally locked, meaning it always shows the same face to its star. Using NASA's Hubble and Spitzer space telescopes, the astronomers analysed the atmosphere of the "hot Saturn" exoplanet and they captured the most complete spectrum of an exoplanet's atmosphere possible with present-day technology. By dissecting starlight filtering through the planet's atmosphere into its component colours, the team found clear evidence for water vapour. Although the researchers predicted they would see water, they were surprised by how much water they found -- three times as much water as Saturn has. This suggests that the planet formed farther out from the star, where it was bombarded by icy material. "We need to look outward so we can understand our own solar system," explained lead investigator Hannah Wakeford of the Space Telescope Science Institute in Baltimore, Maryland, and the University of Exeter in Devon, Britain. 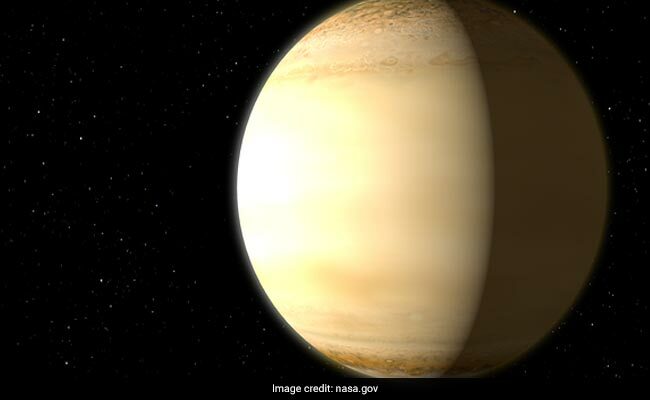 "WASP-39b shows exoplanets can have much different compositions than those of our solar system," said co-author David Sing of the University of Exeter in Devon. "Hopefully this diversity we see in exoplanets will give us clues in figuring out all the different ways a planet can form and evolve," Sing said. The day-side temperature of WASP-39b is a scorching 776.7 degrees Celsius. Powerful winds transport heat from the day-side around the planet, keeping the permanent night-side almost as hot, according to the researchers.